You are looking at what would have been a new Arizona State Record Largemouth Bass of 17.13# caught at Canyon Lake on January 26, 2002 on Kick'n Bass®. If the State Fish and Game Department would have had an official scale available Bill would now hold the new AZ state record. As it turned out the remote location of the lake and the lack of certified scales means Bill is out of luck with this hog. But knowing Bill it won't be long before he catches even a bigger fish. Keep on Kick'n Bass® Bill! Bill is a life member of B.A.S.S. Bill is a Member of B.A.S.S. Lunker Club, A member of I.G.F.A. At the 1992 Big Bass World Championships, he finished in 8th Place. At the 1995 Big Bass World Championships, he finished in 13th Place. 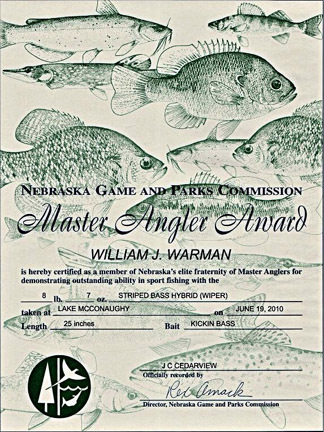 Bill Warman has 13 Bass registered under World Record Regulations in the World Record Book.